Under the plan proposed by Senator Bernie Sanders, all Americans would be covered, after a short phase-in period. WHAT HAPPENS TO MY CURRENT INSURANCE PLAN? Should the plan proposed by Senator Sanders be implemented as outlined, all current insurance programs would be eliminated. This would include both the individual market as well as the employer market (which combined cover more than 50% of Americans. The single-payer options would expand Medicare to cover not only medical and prescriptions drugs, but also vision, dental, as well as Long Term Care. It would also include a wide breadth of reproductive health services including abortion. The government would then set prices that it is willing to pay for procedures, via a master charge list, as it does currently with Medicare. Senator Bernie Sanders’ plan would eliminate cost sharing completely, meaning no premiums, no co-payments, no deductible. In other words, “free” healthcare for all with the exception of prescriptions drugs which, under his plan, would make participants pay up to $200 per year. LOST JOBS: if this plan were to proceed, the consequence would be millions of jobs. Not only jobs that would directly be eliminated in the insurance markets alone, but also ancillary positions such as admins at hospitals, enrollment call centers, etc., who’s jobs would likely become obsolete. The health care delivery system, which relies heavily on the private pay platform, would also be operating under thinner margins due to reimbursement rates under Medicare. As a result, other jobs such as janitorial, clerical, etc. would also likely be re-adjusted (i.e. eliminated). ACCESS: remember the famous “if you want to keep your doctor” statement made during the debate over the Affordable Care Act? For many Americans, this promise didn’t pan out. Under a Medicare for All platform, likely this un-kept promise would expand to even more American’s. If Uncle Sam is paying for it, likely he can tell you where to go to get it – it’s no longer your choice rather the U.S. governments. RATIONING OF CARE: I’m not saying death panels, but yes, there would now be a government entity that would control what possible claims/procedures would be approved and those that would be denied. Right now, insurance companies get to be the bad guy, but in a Medicare for all platform, Uncle Sam gets to make these decisions. As a result of budget management, things like age, life expectancy, past life choices, etc. could come into play when deciding what conditions/care should be provided and YOU wouldn’t be the one getting to decide because there would be NO private pay option. Each American would relinquish their right to care to the U.S. Government (regardless of their ability to pay). 52% on income above $10mm. Elimination of current tax expenditures (i.e. write offs) for corporations (for example employers would no longer write off health insurance premiums as an expense). Increasing taxes on those wealthier than others might sound like a good idea to some, but let’s face it, the wealthy in our society know how to stay wealthy. Personally, I’ve never gotten job much less a pay raise from someone not wealthy. In the end, it’s the middle class that would suffer due to higher taxes as it would likely result in lower wages, fewer jobs, etc. Sure, everyone would have free healthcare, but many more could quite possibly find themselves utilizing food stamps as well. LOSS OF INNOVATION: While there is no question, we need to do something about the rising cost of health care (which causes increases in health insurance), Medicare currently reimburses for medical procedures and drugs on average approximately half of what the private insurance market does – that means a significant loss in revenue for companies that innovate and develop new treatments and technologies. The United States is responsible for roughly 70% of the world’s innovation and advancement when it comes to medicine. A Medicare for All could mean the end of new treatments, medications and cures. Not just every day Americans, but the world (who relies on our free-market capitalistic system in the U.S.) could suffer from a socialized platform in the U.S. 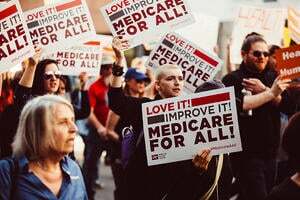 In the end, Medicare for All may sound good to an uninformed American electorate, but what that segment of our society doesn’t realize is the possible fall out. When it comes to health care, free isn’t free and many do not see that in the end everyone would be paying for single payer, some directly, but everyone indirectly. We must do something to curb the rising cost of health care in the United States but at the same time, create a system where innovation can continue, access could be obtained and incomes could be protected. There is no one-size fits all in how we approach a solution, but nonetheless we cannot continue on the path we are on today. Health care in the U.S. is not broken; it just works too well for too few. We can make it better but Medicare for All is not the answer.